Fantastic time spent in this hotel. The location is perfect for access to all Palermo's bars and restaurants along with the beautiful sites and sounds of this gorgeous city. Alessandro and the staff are all friendly. Highly recommend this great hotel. An older, traditional hotel just a couple blocks from the major crossing of two main streets of Palermo. But up a quiet side street. So very close to a tourist office, many sights, interesting shops and restaurants. Walking distance to the train station. Staff is very kind. Breakfast was a nice buffet with a variety of breads and rolls, etc. Coffee/espresso/cappuccino made to order. We stayed twice so had 2 different rooms. The rooms are on the small side but clean and comfortable enough with large wardrobes and small desks. Bathrooms are adequate. Good value. Friendly staff, clean room, good price and lovely location. Highly recommended! The hotel is at the heart of Palermo, but in a quiet side street where you will not be disturbed by noise as the area is pedestrian. Palermo fabulous. Hotel basic but clean and adequate. Very central for everything in Palermo. Breakfast basic but adequate. Toilet wdn't flush and required fixing though staff took some convincing that it wasn't just that I had the technique wrong. They reluctantly came up to find it needed fixed, which was done promptly. Toilet had stale urine smell so I bought toilet bleach and used it all week in order to breathe in without smelling stale urine. However, that said, the cleaners did a great job all week. My room was basic but adequate and unfortunately situated across from what seemed like immigrant workers accommodation so it was very loud at night and without ear plugs I wd not gave slept well. Breakfast basic but adequate. Staff mainly friendly and helpful. Iwner/manageress seemed disinterested in guests or her business though her husband went out of his way to help when he was there. Wd stay again but not in room 201. Very welcoming staff. Had a lovely room at the back of the hotel, which could have slept 4 people, so we had lots of room. Breakfast was fine and the hotel was exceptional value. Be aware there is no lift, so staying on the top floor meant 3 flights of steps. Receptionist gave us coffee and cakes on arrival as we had arrived early from Naples on the ferry. Also great recommendation for excellent local restaurant. We stayed in hotel Columbia for 3 nights. The hotel is nice and cozy and the staff is friendly. Our room was very small. But it was clean. The bigger issue is the difficult access to the hotel. It is located in a pedestrian only area, and the street it is on is under construction. So, forget getting there by car. And even by taxi it takes some walking. Nice location just of via Marquada. Staff friendly and helpful. Nice hotel. No lift. Rooms on the small side but adequate. Continental breakfast provided. Small narrow road uphill to hotel with lots of building work. Very busy with cars and scooters. 10 minute walk to bus/ train station. This is a very nice guesthouse conveniently located in a quiet back street near the Quattro Cante. Its very reasonably priced and a tasty continental breakfast is included. The rooms are nicely furnished and airconditioned and face out onto an inner light well. The staff was friendly and helpful and the place met all our needs. I felt special at the front desk. The clerk bought my luggage up to the 2nd floor for me and I have not asked for it. The other clerk gave me a map and helped me locate myself. The location is ideal. Breakfast was hearty. The room was clean. 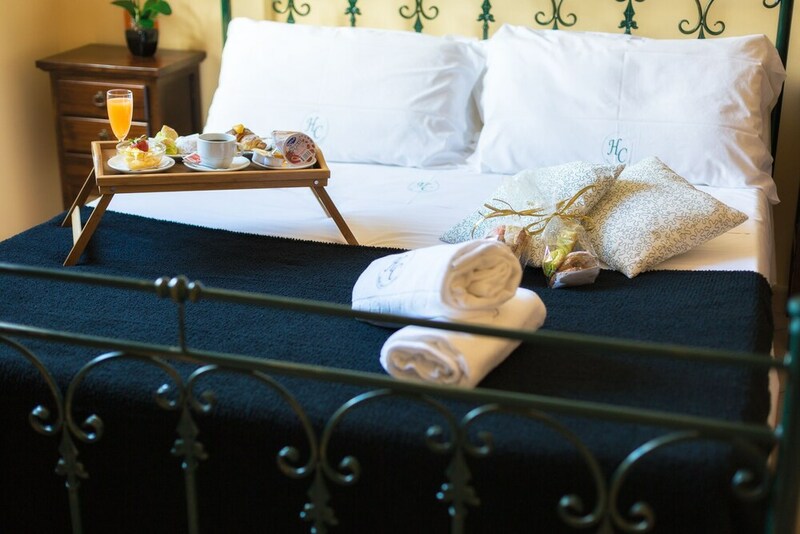 Located in Castellammare, Hotel Columbia is within a 5-minute walk of Via Roma and within 15 minutes of other popular attractions like Palermo Harbour. This 23-room hotel welcomes guests with conveniences like free breakfast, a bar/lounge, and free in-room WiFi. Free buffet breakfast is served each morning from 8 AM to 10 AM. Order from room service to satisfy your hunger without leaving your room, sip a beverage at the bar/lounge or coffee shop/café, and mingle with other guests at the free daily manager's reception. Guests can enjoy a flat-screen TV and stay connected with free WiFi. The bathroom offers hair dryers, free toiletries, and bidets. Guests of Hotel Columbia enjoy access to free WiFi in public areas, a meeting room, and coffee in a common area. If you drive, self parking is EUR 15 per day, or you can take advantage of the airport shuttle (available 24 hours) for EUR 40 per room one way. Multilingual staff at the front desk are standing by 24/7 to help with concierge services, luggage storage, and securing valuables. Additional amenities include a computer station, express check-in, and a porter/bellhop. Free buffet breakfast is served daily from 8 AM to 10 AM. Guests can enjoy a free manager's reception daily. The preferred airport is Palermo (PMO-Punta Raisi): 37-min drive, 19.9 mi/32.1 km.